Having students engage with scholarly material to understand the process of argument development is an expectation in higher education. Using a DHSS approach, your students can understand how academics develop and prove their arguments by using digitized material to prove or disprove an academic argument and then visually present their findings to a wider audience. The organization of digital materials to support or refute an argument put forth in a secondary source. 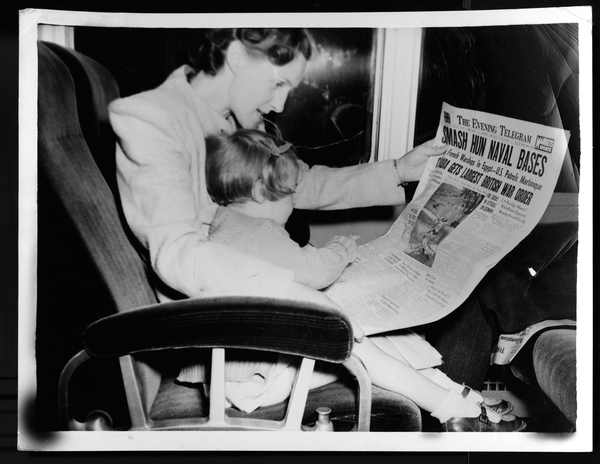 In Robyn Le Lacheur‘s exhibit: “Looking Back: Temporal and spatial connections of post-war migration and displacement through the eyes of the Toronto Telegram,” she used photographs published by the Toronto Telegram to explore patterns of migration and settlement after World War Two. However, she also used a corpus of digitized materials to compare what she saw in these photographs to others’ analysis of similar materials. One of the comparisons she made was against Terrence Wright’s article “Moving Images: The Media Representation of Refugees“ published in Visual Studies in 2002. Robyn reviewed the article, highlighted Wright’s findings, and then assessed whether his argument held water in relation to the archive she was working with by tagging the photographs in her digital archive that aligned with Wright’s argument. While Robyn explored this argument in one page of a larger exhibit, your students could create a whole exhibit proving or disproving an argument found in an academic article using the digital materials explored in class. Using Scalar, WordPress, or another web publishing forum, have students demonstrate their understanding of an article and then showcase how and why they support, or contest, the scholars’ conclusions based on digital materials they would present across multiple pages. This task can be done with any number of academic articles and digitized collections (if your students are not digitizing materials themselves) and can invite creative ways for your students to think through, and present, an academic argument in something like an exhibit. In 1993 Peter Geller looked at the representation in HBC’s The Beaver between 1920-1945. Can your students showcase the “particular meanings” Geller identified when looking at digitized copies of The Beaver after this time period? Can your students use the same method of analysis, but perhaps use a tool like Voyant, to support Shannon Wiltsey Stirman and James Pennebaker’s argument that suicidal poets are more apt to write about self than others, but using digitized poems from Canadian poets? How does masculine identity interact with consumption in older advertisements, as Jonathan E. Schroeder and Detlev Zwick found in their 2007 article “Mirrors of Masculinity: Representation and Identity in Advertising Images“? Can your students explore the “regime of translation” in their neighbourhoods by photographing and posting examples of translated signs on public streets, like Brett Neilson did with signs in Australia and Italy in 2009? Or can they replicate the work that Robert Gutsche and his colleagues did in “‘No Outlet’: A critical visual analysis of neoliberal narratives in mediated geographies” (2017) to explore the process of “geosemiotics” in their own cities? Proving/Disproving an Argument by Samantha Cutrara, PhD, for the Office of the Vice Provost Academic, York University is licensed under a Creative Commons Attribution-NonCommercial-NoDerivatives 4.0 International License, except where otherwise noted.